Alright, I have another form going on converting the KJet system on my B21FT. Currently my car has B23F in it running LH 2.1. I want to take my 160 head and put it on the B21Ft (also from an 84 but with KJet 398 head) since the 398 head needs a rebuild and has holes from the KJet injectors. So basically, will my 160 head work on my b21ft, and will. I need anything else to get rid of the KJet? My plan was to take my LH 2.1 manifold and fuel rail with injectors, along with the AMM and idle control valve, and the distributor. I will leave my current Lh 2.1 wiring in the car. Am I missing anything? From what I was reading when I looked up the numbers off my Bosch Ecu in my car it showed LH 2.1... Are you sure it's a 2.0? I read the 2.0 is pretty rare, and only available on earlier 81-82 cars. Actually, I see what you mean. The numbering is so confusing to me. What technically would be the issue with running my current 160 head with the LH 2.0 on the B21FT (with the dizzy from my b23) I don't see why It wouldn't work unless there's a fuel issue I don't understand. Some 398 heads have BCP, some have SCP. Same with the 160 heads. The change in coolant passage size occured sometime during the 1984 model year. The 398 heads were introduced in the late '70s when the early 160 heads had erosion problems. 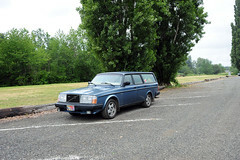 At the same time, Volvo started using the updated aluminum alloy on the 160 heads. So, there really isn't any difference between the two, except for the casting number. 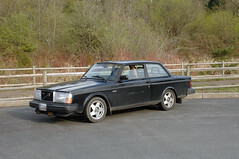 1.0 - Some 1982 B21F engines, typically late production, and California spec. 2.1 - 1984.5 B23FT with 507 ECU and EZK102K, first version with white fuel system relay. 2.2 - 1985-88 B230F, 1985-89 B230FT, various ECUs used. 511, 544, 554 are non-turbo, 517 and 541 are turbo. 240 used Chrysler box - two or three different part numbers on these as well. 700 used EZK115K or 117K. 2.2 was also used on the B280F in the 760/780/very early Euro spec 960 (like 1990-91), which used the B280 instead of the B6304 engine. 2.4 - 1989-98 B230F, 1990-98 B230FT, 1989-91 B234F (probably B204FT/GT as well, in addition to B200F/FT, etc), again, various ECUs used. EZK116K ignition. 3.1 - 1990-93 B230F with M47, typically in 240 with M47. Uses heated film AMM. There are some other improvements that you'd notice by upgrading. Not to mention the fact that Dave Barton already has a conversion harness that can be used for turboing an LH 2.2 240. Great information! If worse came to worse though, would I technically be able to use my current LH 2.0 setup? Probably. It just wouldn't run very well in boost. How could I make it run better with the 2.0? Better injectors? Is mega squirt an option? I have an LH 2.2 Ecu and 007 mass air flow in my garage, I'm going to try converting my B23F first. After I do that, will that set up work with the B21FT? Let's go back to basics for a minute using an overly simplistic example. Standard atmospheric pressure at sea level is 1 bar or 100 kPa or 14.5 psi. This is the pressure that a NA engine has to work with. Now, for discussion, let's say that you add a turbo with 14.5psi of boost and a [fictional] intercooler that drops the boosted air temperature back to ambient. With this, you're running twice the airflow as a NA engine! Wow, double the engine size under boost, no wonder folks love turbos! - An ECU that's programmed to handle 2x boost and associated airflow. NA ECUs don't go this high. - An ignition system (EZK) that's programmed to handle 2x boost. NA EZKs don't go this high. Yes, a megasquirt conversion may be easier for you. MegaSquirt can be challenging to setup and tune on your own without help. I'd post in wanted for someone local who can show you their megasquirt install and talk you through all the steps. Maybe it's for you, maybe not.